You can start 2019 by taking your first step toward your debt-free future. 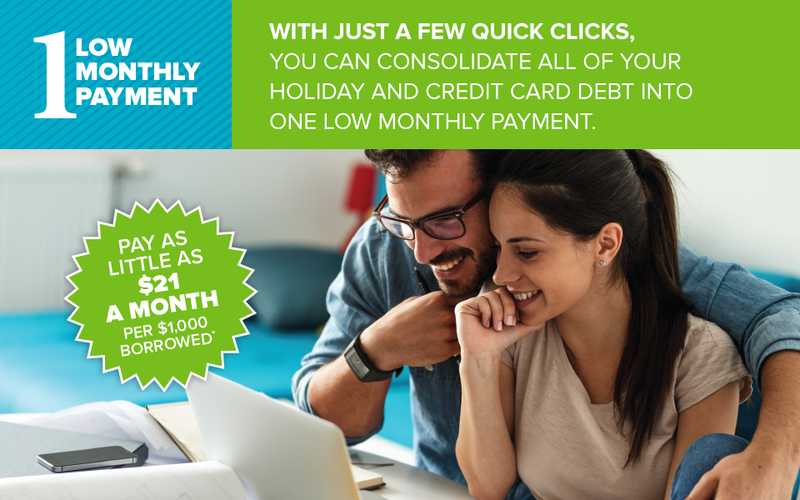 With just a few quick clicks, you can consolidate all of your holiday and credit card debt into one low monthly payment. You could pay as little as $21 each month for every $1,000 you consolidate. With a rate as low as 8.45% / 9.98% APR* and No Balance Transfer Fee, you can pay down your debt faster with a lower rate and one simple low payment each month. You could save hundreds in interest charges and fees and start working toward your debt-free future right now. Pathways makes it easy to apply and pay. This is a limited time offer, so please apply today. Pathways makes it easy to apply and pay. Just click the button below and choose “Lifestyle Loans & Lines of Credit” to begin! Questions? We are here to help. Call our Loan Center at (614) 416-7588, text APPLY to (614) 340-4100 or visit any of our Central Ohio locations. * Annual Percentage Rate. Rates effective as of January 1, 2019 and are subject to change. Credit score of 740+ required for 8.45%/9.98% APR; APR includes $35 processing fee. Your interest rate and repayment terms will be based on your individual credit history and may be different from rates quoted above. Monthly payment example of $20.49 per $1,000 borrowed based on loan amount of $20,000 over 60 months at 9.98% rate. Minimum loan amount $500. Offer valid through March 31, 2019. To obtain additional information, please contact our Loan Center at (614) 416-7588.